General Information — What is Aging Projects, Inc.? 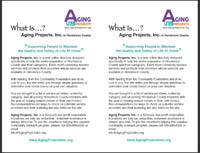 Information about Volunteering with Aging Projects, Inc.
Information about becoming a Service Provider with Aging Projects, Inc.
From there, you may print either all 3 pages or just the page(s) you wish. Either print one copy to use to make additional copies on a copy machine, or make as many copies as you want directly from your printer. Note that each printed or copied 8½ by 11" page should be cut to make two half-sheet-sized brochures. Use the color version to print from a color printer and/or reproduce on a color copier. Use the black-and-white version to print from a black-and-white printer and/or reproduce on a black-and-white copier. We don’t recommend reproducing a color page on a black-and-white copier. The logo won’t look as good and the colored text may even be illegible. For help with downloading the brochures, contact the Webmaster. For ideas and suggestions on distributing the brochures where they will be most helpful, contact the Marketing Team. 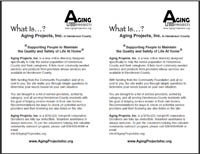 For general information about Aging Projects, Inc., contact the Director.